Picpoul Blanc is actually known by several different names, depending on where the grape is planted. In the Loire Valley, it is known as Folle Blanche. In Spain, growers refer to the variety as Picapoll. There are also three different versions of the Picpoul grape. There is Picpoul Blanc, Picpoul Gris which are both used for white and and there is also Picpoul Noir, which is a blending grape used not with not too much frequency in the Southern Rhone Valley. Picpoul Blanc is one of the older white wine varietals from the south of France. It is perhaps most popular in the Languedo Roussillon appellation. Picpoul is a shrill, acidic grape that often delivers high yields. In fact, a loose translation of Picpoul means stings the lip. 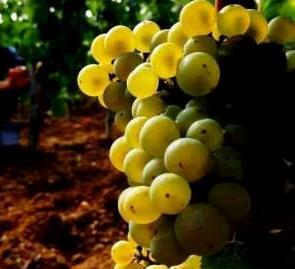 That lip stinging quality refers to the grapes natural, very high acidity level. Picpoul Blanc is the key grape in the AOC, Picpoul de Pinet, as you would naturally expect, with its name. Perhaps there are close to 1,500 hectares of Picpoul planted in all of France, and more than 1,450 hectares are cultivated right here, in the Picpoul de Pinet appellation. There are a few producers in Picpoul making, bottling and selling their own wine, but the majority of the harvest here goes to the 4, local cooperatives. Cave de Pomerols in the Coteaux du Languedoc appellation is one of the better producers making wine from 100% Picpoul Blanc. However, the vast majority of the time, due to its high level of bracing acidity, the grape is almost always blended with fleshier varieties to add additional layers of freshness, tropical notes and bright citrus qualities. Clos des Papes uses a fairly large portion of the grape in their white Chateauneuf du Pape blend at close to 20% of the blend. Most estates in the region use a lot less Picpoul in their white wine blend. Picpoul Blanc was much more popular before phylloxera struck the vineyards of Europe. From that point forward, much of the land devoted to Picpoul was replanted with other varietals. Picpoul, with its ability to grow in sandy soils remained in the south of France, Portugal and Spain. Picpoul is used only as a minor blending grape in Chateauneuf du Pape. The grape is slightly more popular in the Gigondas appellation. Picpoul Blanc for wine and food pairing works best in food matches featuring strong flavored sea food dishes like salmon, swordfish, scallops, clams, oysters and rich cream or butter sauces. Picpoul Blanc is also planted in the Central Coast area of California. The largest plantings in California can be found at Tablas Creek, which is co-owned by the Perrin Family of Beaucastel. In the Walla Walla appellation of Washington State, Gramercy Cellars produces a wine from Picpoul Blanc.